سامسونگ گلکسی اس 4 زوم با دوربین 16 مگا پیکسل - هشت گیگابایت حافظه داخلی (8GB) - پردازنده 1.5 گیگاهرتزی دوال کور (1.5 GHz dual-core processor) - صفحه نمایش 4.3 اینچی با رزولوشن 540 در 960 (4.3-inch 540 x 960 pixels) - اندروید 4.2 (Android 4.2 Jelly Bean) و قیمت 468 پوند (£467.99) معادی 733 دلار ($733) و 548 یورو (€548) بزودی در انگلستان عرضه خواهد شد. 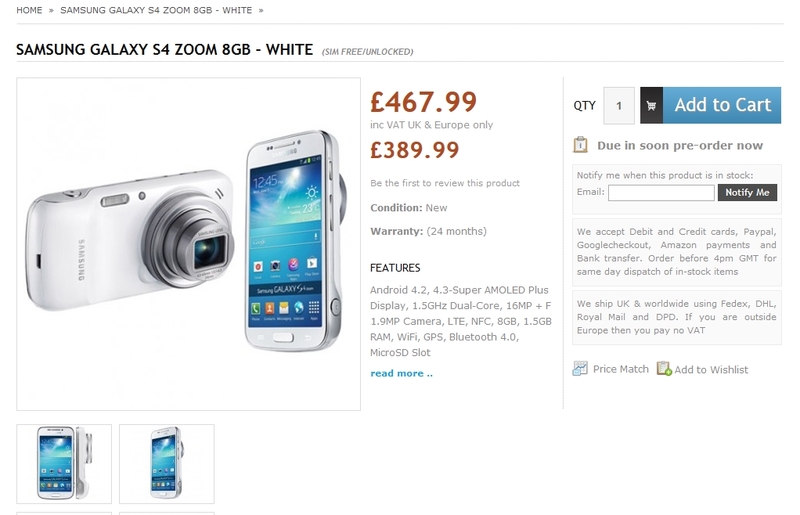 Mobile phone users in the UK interested in the purchase of Samsung’s new Galaxy S4 Zoom camera phone can now reserve it for when it is put up for sale in the near future. The mobile phone has emerged over at UK online retailer Handtec, which has it listed at £467.99 with VAT included ($733 / €548). For those out of the loop, we should note that Galaxy S4 Zoom lands on the market with a 4.3-inch 540 x 960 pixels screen, a 1.5 GHz dual-core processor inside, a 1.5GB of RAM. Furthermore, the handset sports 8GB of internal memory, a microSD memory card slot, and Google’s Android 4.2 Jelly Bean OS loaded on top. The main selling point of the device, however, is its 16-megapixel photo snapper on the back, with optical zoom and Xenon flash.